Gatehouse of Fleet is set to welcome an international star from Africa for the 11th annual Midsummer Music Festival on June 23rd -25th. This year’s headline act is the Jit Jive Band fronted by Rise Kagona, who came to fame with the Bhundu Boys. The Zimbabwean band became one of Africa’s biggest musical exports in the 80s and 90s and were favourites of the late great Radio 1 DJ John Peel. Peel it was who introduced the band and the infectious rhythms of jit - a musical fusion of pop, rock and roll and traditional African dance music – to the wider world. 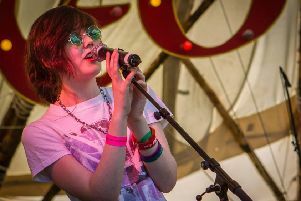 The organisers, Gatehouse Festival Group are ‘proud and excited’ to have landed such a class act to light up the main stage on Saturday night. Chair Michelle McClure said: ‘As always we have a huge variety of music throughout Gatehouse over the festival weekend, but we’re particularly excited about our headliners coming to Galloway. Sharing the bill with the African legends are singer-songwriter Alan of Galloway, Kirkcudbright’s rising stars The Sax Pistols, and Scottish festival supergroup The Hoolits. Treasurer Philip Hussey said: ‘We’ve been very fortunate with our Saturday concerts over the last few years, and having Gatehouse Primary School hall filled with happy, dancing people is one of the pleasures of the festival. As ever, Gatehouse will be a-buzz with music over the whole weekend. The festival programme includes Black Mango at the Bank of Fleet on Friday 23rd, The Razorbills at the Ship Inn on Saturday afternoon, and Pete McConville, Julie Ward and Richard Ipaint at the Mill on the Fleet on Sunday. Other highlights include festival favourites the Youth Showcase/McMillan coffee morning (Saturday, 11am, Gatehouse Primary), the open stage (Bakehouse, Saturday 3pm) and the Masonic Sessions (Friday night and Sunday afternoon). For full programme details and to purchase tickets for the Saturday concert, visit www.musicgatehouse.com. Tickets are also available from Franca Bruno’s shop in Gatehouse.